With best bruised oats and other cereals, carefully micronised to improve digestibility which helps reduce the risk of digestive upsets. These supply calories from soluble carbohydrate and fermentable fibre. Includes quality digestible fibre from grassmeal to help with rumen function to minimise acidosis. Quality protein for muscle and tissue repair and development as well as milk and hair production. Fully balanced with vitamins and minerals for health and well-being. Include Sel-PlexÂ® organic selenium to support fertility, immunity and muscle function. Much modern pasture and forage is selenium deficient so ensuring goats receive a good supply of this vital mineral will help support general good health and be passed to kids via the milk. With a blend of Omega 3 and 6 fatty acids for a shiny coat. 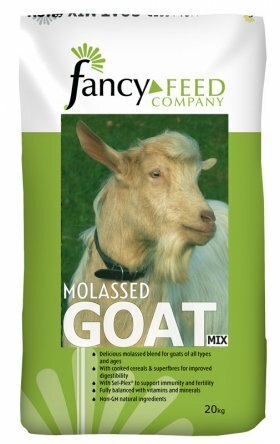 Molassed Goat Mix should be fed as required alongside forage based on the guidelines in the table above. Divide the concentrate ration into two or more small meals. Make any changes to diet gradually over 7 to 14 days to avoid upsetting the bacterial population of the rumen. Ad lib forage (grass, hay, haylage) should be available year-round and should comprise a minimum of 40 - 50% of the total daily ration. Feeding hay or fresh forage before giving concentrates will initiate chewing and saliva production and aid bicarbonate production. This buffers the acids of the rumen to help maintain a stable rumen pH which is especially important at the morning feeding. Mouldy feed or forage is potentially lethal to goats as the mould can upset the bacterial population of the rumen. Chopped alfalfa products, such as Alfalfa Blend from the Baileys Horse Feed range, are ideal sources of additional good quality protein and fibre.